But like many things at Trader Joe’s they like to tease you with great items and come back and try something new every time. So, this is my new bag of gnocchi: Trader Joe’s Gnocchi alla Sorrentina. In plain English it’s regular gnocchi with tomato sauce and some cheese. Now, dried gnocchi isn’t that expensive. Nor does it require a lot of cooking skills. If you can boil water and set a timer, you are good to go. However, like so many evenings I was in a rush to get things done. 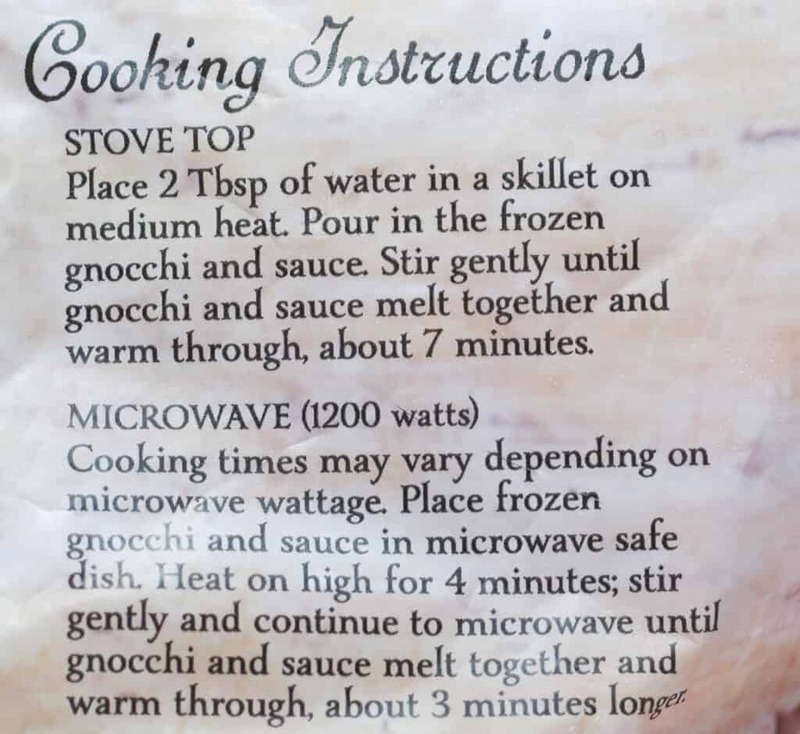 Good thing too, because I think you can pair down the cooking directions. Going by what the bag says alone you are looking at 7 minutes in the microwave. I found it didn’t need the extra 3 minutes. In fact I found the food to be borderline nuclear when I took it out of the microwave after the first four minutes. After a good stir I wish they had included at least another 2 tablespoons worth of sauce. It seemed a bit dry. I also wondered where the cheese was. 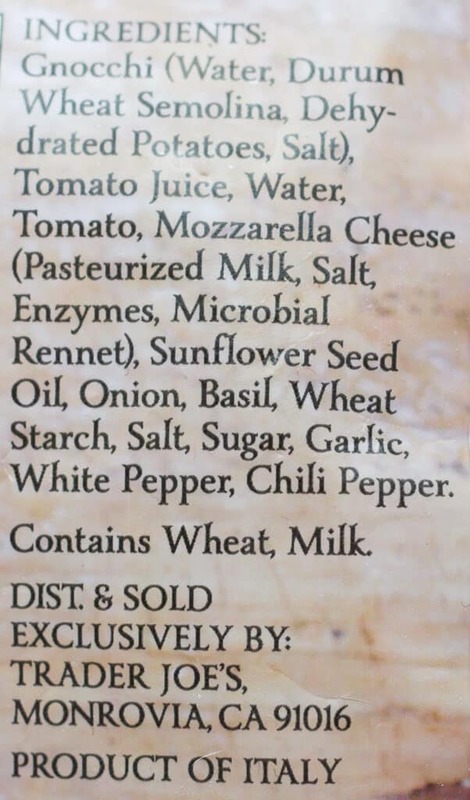 But cheese is a staple in our household so that made no difference. If you are wondering I kept with the meatless theme and used Trader Joe’s Meatless meatballs. But most meatball, chicken, or veggie product would pair well with this. As mentioned above this gnocchi was on the dryer side. I wish there was more sauce or something really special about this. It was good gnocchi but nothing I can beyond it’s gnocchi with jarred tomato sauce. The only convenience here is that I didn’t have to boil a pot of water or clean that pot of water. Will I be buying this one again? Sadly, I’ll pass on this. But if I see the Trader Joe’s Sweet Potato Gnocchi with Butter and Sage again I’ll knock you over in the aisle for it. That was something worth hunting down. Probably because it hard to find a dried sweet potato gnocchi available. For $2.99 they aren’t a great deal either. 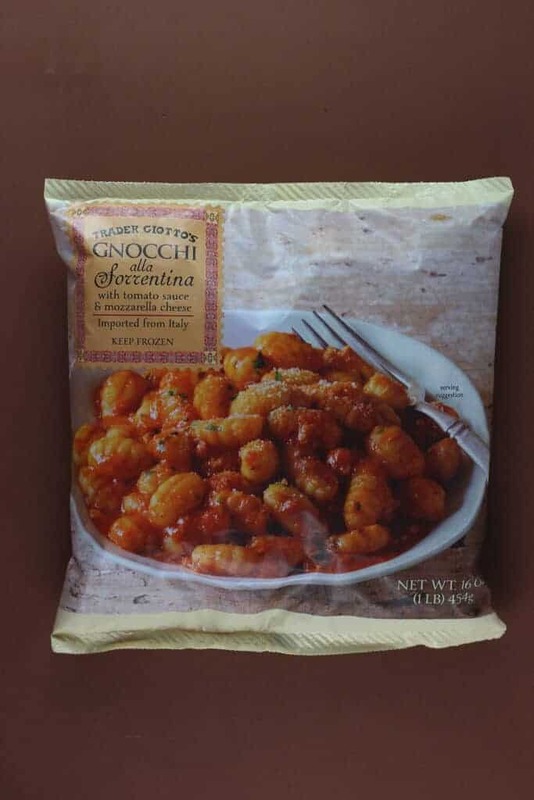 Potato gnocchi is easy to come by, Sweet Potato gnocchi in a package is a lot harder to find. I think that they could had done similar to baked ziti. Call it baked gnocchi. I think I tried this a long time ago and wasn’t impressed. 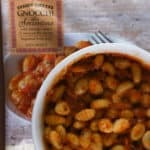 I’ve had handmade gnocchi several times at high end Italian restaurants and I’ve virtually never had a frozen or dried gnocchi that comes close to freshly made. Gnocchi should be light not dense, pillowy and fluffy. It should literally melt in your mouth. I actually have an interesting recipe for spinach and ricotta gnocchi that is pretty darn good. 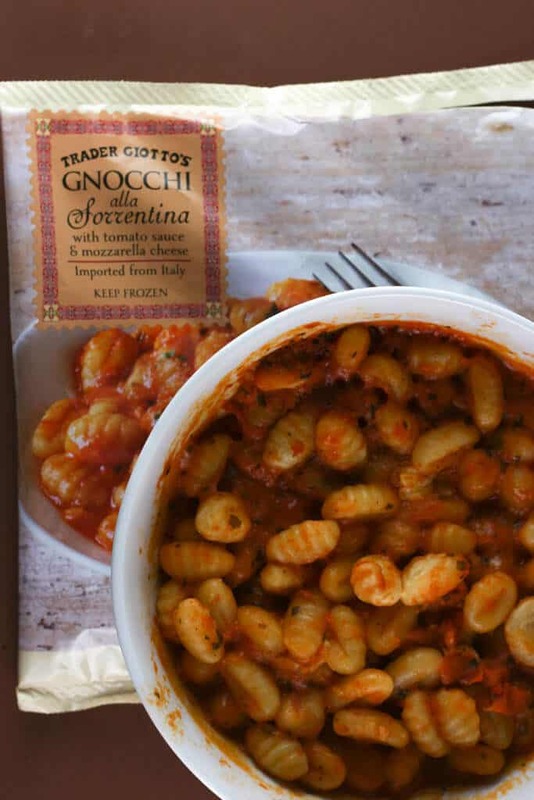 PS- I was at TJ’s tonight and they had just gotten in a big batch of the sweet potato gnocchi with sage butter! Hey Dag! Yeah, this one was underwhelming for me too. And I agree with you totally. At the end of the day all it is a freezer meal. I had the sweet potato gnocchi for dinner tonight. I’m curious to hear what you think. Thanks as always for stopping by! Haven’t tried this one or the frozen sweet potato gnocchi because of the dairy (ugh) but i do love the dry gnocchi and buy it often. I wish they sold the sweet potato gnocchi plain! I think i would love it. Those trader joe’s meatless balls are a freezer staple for me! I actually made a tomatoey bean soup the other night and used some of the meatless balls crumbled into it. The heating instructions are crazy- 7 min on the stove or 7min in the microwave?? Huh? Hey Ttrockwood! 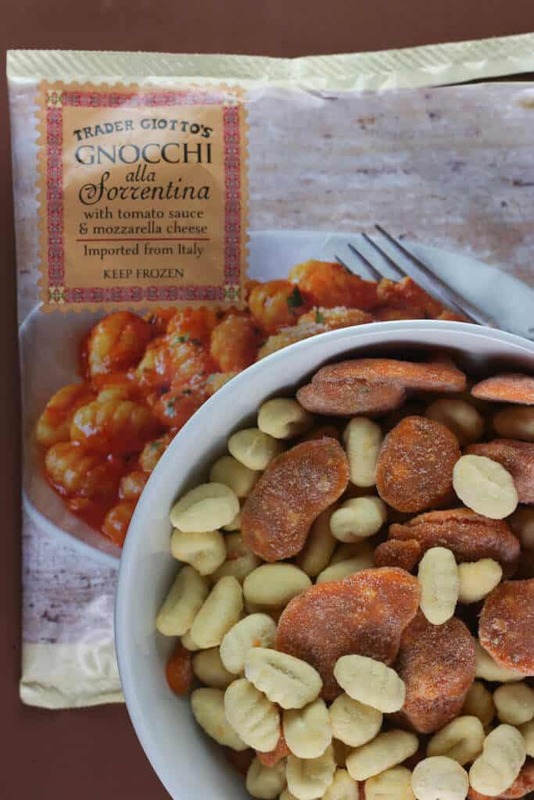 They do have a dried gnocchi so you can be dairy free if you want. And yes, those meatless meatballs are a staple in my household too. Thanks so much for stopping by!